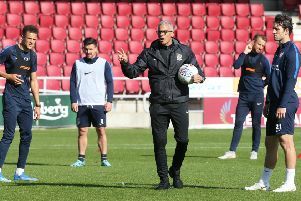 Keith Curle says he isn’t working out the mathematics of what his Cobblers team needs to do to clinch a play-off place at the end of the season. But the Cobblers boss does admit that the potential of clinching a top seven finish in May is a serious motivation for him and his players. With eight games of the season remaining, the Cobblers have given themselves an outside chance of an unlikely promotion. An eight-match unbeaten run and a haul of 18 points from a possible 24 has catapulted Town up to 11th in the Sky Bet League Two table, and to within six points of seventh-placed Exeter City. Town’s run-in also looks kind, with the team due to face four of the current bottom five in their remaining fixtures, but Curle insists he isn’t working out how a play-off place could be achieved. Instead he’s sticking to the old adage of taking things one game at a time. Asked if he has tried to work out the maths of what Town need to do, Curle simply said: “No. “The focus within the group at the minute is the next game, and the next opportunity for us to try to obtain three points. That hasn’t changed from the day we walked in. And he added: “The potential of ending the season on a high is very important. “There is a definite connect between the players in the changing room, the staff, the supporters and the football club infrastructure. The Cobblers are back on the road on Saturday when they travel to 17th-placed Cheltenham Town, and although Curle is looking forward to the trip, he is expecting a tough test. 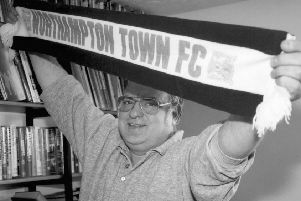 “I find Cheltenham a very enjoyable ground to go to, very friendly, very homely, and I have managed and coached there and had some good games and enjoyed it,” said the Town boss. “Under a previous regime when it was Gary Johnson there, and he always made me feel welcome. “They are another team on their day that can cause problems. “They have got a very good home record over the past five or six games, winning games, and they are a confident bunch who are playing well. “They have a new manager (Michael Duff) who came in this season, and he is adapting and adopting his style of play to league two, and finding out about the division in his first role in management.